Inspiring Thirst » Blog Archive » Eloro? Posted on August 15, 2017, 4:35 pm, by Kermit Lynch Wine Merchant, under Italy, Monthly Newsletter. You are likely unfamiliar with this wine zone of southeast Sicily, just outside the hilltop town of Ispica and its stunning Baroque architecture. More likely you know its star grape variety, Nero d’Avola. While it can be found all over Sicily, Nero d’Avola takes on another dimension in the white, chalky soils of the Eloro appellation—the grape is said to have originated nearby, and it arguably makes its greatest wines here. Breezes coming off the Mediterranean temper the decidedly hot, arid climate (these are Italy’s southernmost vineyards, on the same latitude as Tunis), while the abundant limestone ensures the roots of the vines stay cool, preserving acidity and giving the wines a welcome freshness. While Nero d’Avola produces pleasant wines for easy drinking all across Sicily, nowhere else does it reach the complexity, grandeur, and refinement possible in Eloro. A great terroir, of course, is only half the equation: it takes a talented vignaiolo to harness the natural richness of the territory and put it into bottle. That man is Massimo Padova, who founded the Riofavara estate in 1994. The dry conditions in southern Sicily are naturally favorable to organic agriculture, but the pursuit of quantity over quality meant that industrial farming dominated until only recently. 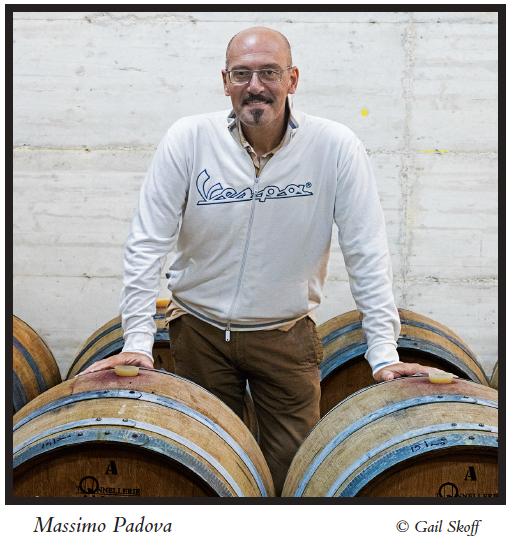 In addition to pioneering organic viticulture in the region, Massimo became the first to vinify with native yeasts, seeking authentic expressions of Nero d’Avola from his low-yielding, dry-farmed vines. His visionary approach and uncompromising precision in his work result in wines of great harmony that ally Nero d’Avola’s intense blackness with lively fruit and silky-smooth tannins. Here is a soft, round, deliciously accessible Nero d’Avola that escapes the grape’s all-too-common pitfalls of overripeness, excessive alcohol, and low acidity. The perfume suggests blackberries, violets, and baked earth, while the aging in used barrels and unfiltered bottling have given a velvety, pulpous texture. While the Spaccaforno is at home alongside most Mediterranean-inspired dishes, you might consider exploring the unique, almost exotic cuisine of Sicily, with its Arab influences, for a next-level pairing. From a parcel of the estate’s oldest vines, the Sciavè is by all means a bigger, badder, and brawnier brother to the Spaccaforno. Everything is black: the color, the fruits its aromas suggest, the tarry concentration, its notes of licorice, and the spice elements that prickle the sides of the palate. For all its outright power, this beast of a wine boasts an acidity that keeps things refreshing, along with tannins of remarkable finesse. Massimo also grows some Moscato, which he vinifies bone-dry to fully capture the chalkiness of his terrain. This exotically perfumed sparkler is unlike anything you’ve ever tried. Guava, orange blossom, passion fruit, and wildflowers race across the palate like a lightning bolt, and its fine, persistent bead cleanses the palate with delicacy and class. You’ll try many sparkling wines from all throughout Italy, but the marriage of the Moscato grape with this stony Mediterranean terroir is unrivaled.